Rosie's dream was to have a flourishing career in the hotel business and for a while she was doing incredibly well. She worked in a hotel in New York and her future seemed promising. Something went wrong though and therefore she's back in her hometown. She's managing a seaside hotel in Scarborough. The hotel is Victorian, has more regulars than guests and could use an update. Rosie is having a good time, even though it isn't the bright future she envisioned. However, this changes when the owner sells the hotel to an American company. The new owners of the hotel don't want to keep the hotel's former atmosphere, they have something completely different in mind. To make sure the transition will go smoothly they hire Rory. Rory has to make sure every plan is being executed. However, Rosie is the one who keeps having to give the people she loves bad news. The hotel might be a step in the right direction when it comes to having a career again, if she does her job well, but what about the people she cares about? What will Rosie do and can she and Rory come to an agreement? 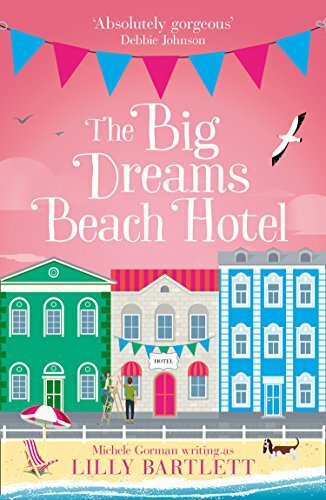 The Big Dreams Beach Hotel is a wonderful story with heartwarming main characters. I immediately loved Rosie. She's sweet and capable and she has a good head on her shoulders. She's a loving person and I liked that a lot about her personality. Rory is a kind man, but he has a difficult task ahead of him. The changes the new owners want to make to the hotel are often ridiculous and I was anxious to find out how Rosie and Rory would handle the demanding American bosses and if they'd find a way to save the things that are the most important to them. I couldn't turn the pages quickly enough to find out where the story would lead. Lilly Bartlett's descriptive writing made me fall in love with the hotel and its inhabitants straight away. I was intrigued by everyone's stories and secrets. I was curious to find out why Rosie left her job in New York and loved the way Lilly Bartlett tells her story by giving the information in small dosages, which made me eager to keep reading. Rosie might have dreams about being somewhere else, but the hotel is where she belongs. I loved the cosy atmosphere and Rosie fits right in. The Big Dreams Beach Hotel is an entertaining story filled with charm, friendship and sweetness. I highly recommend this spellbinding story. If you love stories set in small towns about friendship and love you should definitely read The Big Dreams Beach Hotel. The hotel setting sounds so entertaining! This sounds so good! I recently read a book that was somewhat similar and really enjoyed it. I love the color scheme of the cover, it's so fun! Love the author. Just ordered a copy. I'm curious about all those ridiculous changes the new hotel owners want to make. Something about Hotel stories is always entertaining. You have the permanent folks and the guest. It's a god set-up. I love reading books where the characters have very different jobs from anything I've ever had. This book sounds like such a great escape from the everyday mundane! It sounds like an awesome holiday read! I love the sound of this, especially the part about the Victorian hotel! I've stayed in hotels like this and wouldn't want to change them for all the tea in China!